In the wake of last week’s decision not to indict Ferguson police officer Darren Wilson, Americans came together in more than 170 protests across the country. As Railton writes, through the first half of the 20th century, similar episodes took places in cities across the country. In Tulsa, Chicago, Atlanta, and Detroit, white mobs tore through African American communities, beating and killing residents and wreaking havoc on homes and businesses. The term “riot” connoted violence, aggression, property damage, and fear. And in the 1960s, white political leaders strategically co-opted the word and applied it to unrest in African American communities in order to delegitimize black protest movements. In northern cities, the years following the Second World War saw widespread social mobilizing as African Americans sought to change the political, legal, and economic conditions under which they had been living for decades. World War II saw a period of significant racial transition in the US; the war had given way to a sense that Americans couldn’t fight fascism abroad without contending with issues of racism at home, and across the nation there emerged a growing consciousness about civil rights among both white and black Americans. This awareness about racial justice took shape at a moment when African Americans were experiencing the erosion of the material advancements that had briefly arisen during the war. By mid-century, black communities faced deteriorating housing, rising unemployment, failing schools, and a pervasive lack of political representation in cities across the country. According to historian Ashley Williams, between 1965 and 1968, the United States saw 329 instances of urban unrest in 257 cities. These protests resulted in close to 300 deaths, 60,000 arrests, and hundreds of millions of dollars in property damage. Labeling these episodes as “riots” had profound implications for the affected cities in the decades to follow. The identification of “riot” spaces, writes activist Toivo Asheeke, “holds an inordinate amount of importance on whether one interprets… events as justified or not.” According to legal scholar Walter Olson, in many such areas, riotous associations of 1960s unrest took decades from which to recover. In addition to the immediate property damages, these cities faced reputations of violence, depreciating property values, and redlining. 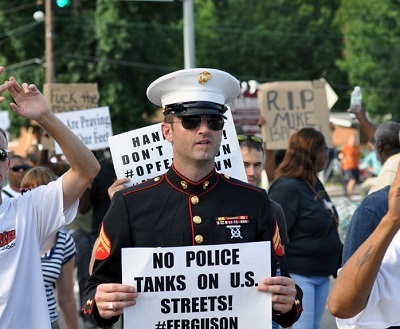 We don’t yet know how Ferguson will be memorialized. Will we remember the demonstrations as legitimate protests against structural inequality, or will it be marked by recollections of violence and property damage? The language with which we talk and write about the events in the St. Louis suburb today could have profound effects on the viability of the community in the years to come. Constitution Check: Will the Supreme Court’s future be an election issue in 2016?